Today marks the historic occasion of Canada's 150th anniversary of Confederation. It's a day for all Canadians to be proud and thankful for what they have. To be sure, our country and our lives are not without issues but most of them are miniscule compared to what they could be. The majority of my posts are prepared weeks in advance, and this one is no exception. So while I can say that I will be partaking in some of the local festivities this Canada Day, I don't yet know what they will be... and the extent will depend on the weather. For the past many months, however, I have been creating little tributes for the occasion and displaying them around the house. I thought I'd share them with you today. This picture that you see here is of our birch tree in the front yard. We had it pruned last fall and a rather substantial lower branch was removed by the arborist. When I saw the flat surface that resulted afterwards, I told my hubby that perhaps I should paint a happy face on it. Months later, we decided that it was the perfect place to display a little bit of Canadiana. How did I do it? After tracing the perimeter of the flat surface roughly onto a sheet of paper, I sat down and drew this, which was then scanned and colourized to see if it would pass muster. We both thought that the design would stand out sufficiently, so the next step was to decide how to transfer it onto the tree. Actually painting it wasn't the ideal solution. After mulling it over, I decided to make something out of paper that I could just somehow glue. My Canada Day tree "sticker"! I figured the Mod Podge would protect it from the elements for at least the remainder of the year. That flat surface of the tree faces the street, so it has been a unique sight for people walking or driving past our house. My other Canada Day crafting revolves around flowers. These ones were made out of scrapbooking paper per my tutorial. The above mini flower is at the centre of a small potted arrangement that's been in our main bathroom forever. Hanging from the window in the same room is this larger set of flowers. 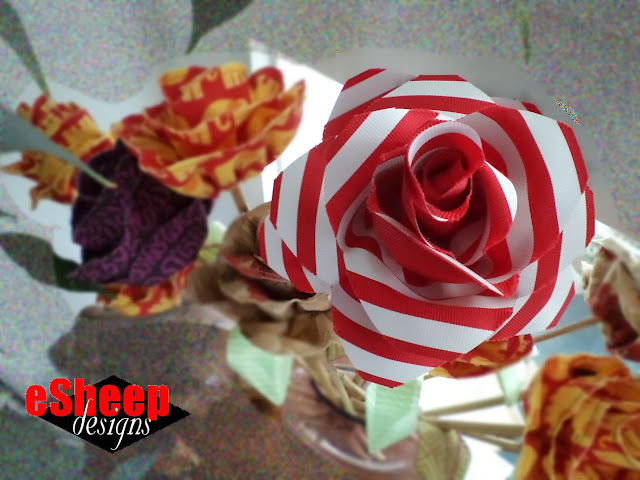 Remember my fabulous fabric flowers tutorial? I had previously made one out of waxcloth, but for a Canada Day version, I tried ribbon. It turned out pretty well. The bonus part is that it became an almost no-sew project, since all I had to do was cut a scalloped edge along a 2.5" wide length of ribbon, gather it, and then hot glue the strip together. This particular ribbon was red underneath, so I could have reversed it for a different look. My last decoration is a set of three "floating" maple leaves. Using the same poster board and leaf template from my tree decoration, I cut out six leaves. I Mod Podged the heck out of them on both sides and then Mod Podged a fishing line between each pair of leaves. Until it was time to take them outside to hang over our front window, they were strung from a light fixture in our upstairs hallway, as shown below. Oh, and here's one final project that is near and dear to my heart since it was my first pattern for sale... I made a Canada themed flap for my Hot Hues Convertible Crossbody Fooler Bag. In truth, I don't think it quite "goes", but at least it's a demonstration of the concept behind this (occasionally controversial) bag! And it served to give me other ideas about how to use all that ribbon that I have. We Canadians mostly accept that the majority of Americans know very little about Canada, other than as a deliverer of cold air in the winter. (We make fun when a prize offered on a TV game show is "a trip to Canada!" Really? Is it to Tuktoyuktuk to see the northern lights? To Jasper or Banff National Park to admire the Rocky Mountain scenery? Or to cosmopolitan Montreal to soak in the culture?) To be honest, many of us resent the lack of interest and knowledge on the part of our closest neighbour, but I'm actually fairly pragmatic about it. When you live on top of the mountain, it's hard to be concerned with what's below you. Still, in today's world, a little knowledge can be an olive branch, so I thought I'd close this post with a list of ten fun facts about Canada for our American friends. Several months ago, I saw a video of a couple of young American girls being asked what they thought Canada's population was. After a bit of discussion, they settled on a guess of four thousand. Now, population totals are impossible to get bang on the gong, but in reality, our 150-year-old country has about 36 million inhabitants. Way more than four thousand, but on the other hand, that's just about the population of the state of California. Measured in total area, Canada is larger than the US. If you count just land area, the US is bigger. The next time you're asked to identify the capital of Canada, try to recall that our equivalent of your Washington D.C. is Ottawa, Ontario. Speaking of provinces, maybe start with Prince Edward Island. It's the equivalent of your Rhode Island in that it's our smallest province. However, PEI actually is an island... and you can get there by car from Rhode Island in about eleven hours! We had a female prime minister waaay back in 1993. She didn't serve long, and was never actually elected to the position. Whatever side of the border you're on, enjoy the birthday celebrations, people! Hi Ann - your area of BC is probably the only place in Canada that can claim to see those temps on a semi-regular basis... and you can have 'em! (LOL) I'm seeing a lot of rain across eastern Canada today and hope it clears up for everyone's celebrations. Have a great one! We're blessed with special friends in the Winnipeg area, and last year we came North(west) to spend some time with them. It was fascinating to me in so many ways, and I thoroughly enjoyed it. One of the things I noticed and loved was that twilight lasts until well after 10 p.m., which is great for summer visits (even though the mosquitos are incredible, too!) I concur with everything on your list and have experienced most of it--yes, you know all of the states, and I struggle to name all of the provinces (though I think I can do it). Knowing Canadians personally has helped me to see how much I assumed and how much I had to learn. We had the incredible privilege to celebrate Canada Day '16 with them--something I will never forget and hope to do again! We can't always choose our neighbors in life, so when we have good ones, we need to let them know that we appreciate them. And we appreciate our Canadian neighbors!